I am wondering what proportion of owned birds are clipped vs. flighted. It would at first appear that most people have clipped birds because it seems that many people don't want to deal with the trouble of flight. However, I'm not sure cause I could see it going the other way too. To me it seems that relatively few people keep them purposefully flighted from the discussions I've had online. However, I have also talked to so many lazy parrot owners that I wonder if the effort to take them in to get clipped is too much for them! So I believe (this is a guess) that number 2 is the rarest case and I'm split between 1 and 3 as being the most common case. Let us know not only about your flock situation but also friends and other people you've encountered with parrots. 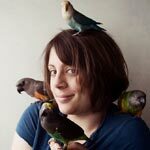 Because knowing if most people keep their birds clipped or not can help us create education targeted toward that type of audience. If we get a lot of interesting responses to this, then I will add a profile field that shows if your birds are flighted or not so we can know how to respond to certain posts where it could depend. What made me think of this question right now is because I briefly saw a video of Harleys_dad's macaw outside and to me (as a new freeflier) the first question that comes to mind when I see a picture of a parrot outside is if they are being freeflown outdoors. I used to assume most people kept their birds clipped but times are changing and that may no longer be a fair assumption to make! I've seen the "Clipped vs. Flighted" debate on soooo many birds and each time it's gone bad...people with strong opinions on both side clashing terribly. I understand that this is not what you mean to do by it, but it will probably be best to keep a close eye on this discussion (warranted there isn't too many of us yet so it shouldn't get too out of hand). I don't believe one is necessarily better than the other. I think there are situations that call for clipped birds and situations that call for flighted birds. So I guess, right now, for 4 our of my 5 birds I intentionally keep them flighted and for one remaining bird I purposely keep her clipped. One, I like the extra exercise my birds get from flying. When they went to my last vet check, they were found to be quite muscular and in shape. It pleased my vet and it pleased me. When I got Joey he was clipped. He was a bit nervous and touchy. I let his wings grow in and he became more confident in himself. He's a totally different bird. If hormones are a-flying and they become a bit, how to put it, less cooperative, I clip one or two feathers to slow them down but not to stop them completely from flying and they start cooperating again. Also, I have a living arrangement that allows me to keep them flighted; the only way outside out of my appartment is through the patio door and this door remains closed most of the time and I only have myself or my boyfriend to look after to make sure all birds are in when the door is opened (this door will now be closed until next spring...). There are no kids to go in and out. The birds are in when I cook so there aren't any chances of them coming and burning themselves and my bathroom door is closed when they are out so no ending up in the toilet. There are no fans to fly into and no place high enough that I couldn't retrieve them if they flew there. If anything would change and would make it dangerous for me to own flighted birds and that the pros of keeping them flighted would be outweighed by the cons, I would probably clip them again. I'll try to make it so that doesn't happen, but you never know. Petey I keep clip for safety reasons. b) I don't want her to be able to fly on me to attack me (we've had some close calls). Until she calms down and acts in a nicer way, she will remained clipped. My bird came clipped from the breeder. Now that his flight feathers have grown in I plan on flight training him and keeping him flighted for as long as it's safe for him. All of my birds are flighted and I will never clip again but I spend a lot of time with my birds and I am also focused on training. I enjoy having flighted birds and I would not enjoy clipped birds. My husband and I also do not have children. We do have a separate bird room and I do have the luxury of being able to modify my living arrangements to accomodate my birds. I also do training and I enjoy the relationship that blossoms out of training. Having said all of that, my biggest worry is finding a bird sitter who will be able to manage them when they are out of their cages. I am working on that. I would love for my birds to be flighted. I know it's healthier for them. My house had a lot of high places that they could get to and I would be unable to get them. Also I have 2 dogs and a ceiling fan. I let my Budgies have a couple flight feathers so they can move about freely but not get the height. Also, I worry about something happening where someone would forget they are out of their houses and they would somehow get outside. So I clip my birds. MissLady9902 wrote: Also, I worry about something happening where someone would forget they are out of their houses and they would somehow get outside. Just a reminder that even clipped birds can manage to fly outside if there is a strong enough gust of wind and something spooks them off. Just making a general statement that clipping a bird is by no mean a certain way to keep a bird from being able to fly outside, this is not intended towards anyone in particular. I wrote this note in the event of someone not too familiar with birds would come by and find this thread. Granted, a clipped bird might make it less far distance wise compared to a flighted bird given the same period of time. Oh I'm well aware of that! Marvin gets good distance with his clipped wings and I'm sure he'd get a lot of distance with a strong wind! Mostly I clip them because of the high places in the house where I would not be able to reach them. MissLady9902 wrote: Oh I'm well aware of that! Marvin gets good distance with his clipped wings and I'm sure he'd get a lot of distance with a strong wind! It was really a general message. I've seen it happen, my mom had one of her cockatoos out and something spook him bad and he ended up in a neighbour's (two houses over) tree. My dad, brother followed him and he came down quite easily (thank god he knew how). He had never flown off and was clipped at the time and never tried to fly before and paf, it happened. Now with her aviary-type patio this isn't an issue anymore. It's all good. I meant what you knew! Cuki because when they flew together they weren't interesed for me . And Cuki was always wilder and more agressive but now that she's dependent to me she is much more tamer . And Memo as younger than Cuki follows her and gets to my hand .